[Jakarta, LTTW] One of the pioneers of Jazz Fusion, Larry Coryell, died on Sunday, Feb 19th, 2017 in New York from heart failure. He was 73 years old. Coryell had been in New York to perform last Friday and Saturday night at Iridium club. He certainly deserves a special place in the history books of Jazz Fusion. Introduced to piano at the age of four by his mother, he then switched to guitar in his teens. In an interview with Musicguy247, he mentioned “What sparked me to getting into the guitar was the mobility of the instrument–I had been taking piano lessons, but the piano, although a great instrument, was large, staid, and kind of ‘establishment’, whereas the guitar was portable—it was like a poor man’s piano, and that appealed to me” (see “Vox de Cultura – Pick ‘n’ Pound”). Although he counted country guitarists Chet Atkins and Chuck Berry among his early inspirations, he also took cues from Jazz masters such as Wes Montgomery, Barney Kessel, and John Coltrane, among others. He was also inspired by popular music of the period, such as The Beatles and Bob Dylan, and worked to bridge the styles of jazz and rock music into his technique. In 1966, he formed a psychedelic band called the Free Spirits, a band that emphasized more complex instrumental improvisation soloing by Coryell and Sax/Flute player, Jim Pepper. Along with his drummer Bob Moses, they joined Gary Burton Quartet and generated what some music historians called the first Jazz Fusion band. Gary Burton Quartet in Berlin 1967, uploaded by JR Ellison. Coryell embraced many types of music during his long career. “If music has something to say to you, whether it’s jazz, country-and-western, Indian music or Asian folk music, go ahead and use it,” Larry Coryell told an interviewer in 1968 according to the New York Times. His most noted breakthrough album was ‘Spaces’, recorded in 1969 with other innovators of Jazz Fusion such as John McLaughlin, Miroslav Vitous, Chick Corea, and Billy Cobham. All of whom made great contributions to Jazz Fusion throughout the 1970s. He played with McLaughlin again in the Guitar Trio that also featured the flamenco maestro Paco DeLucia. Since then, Larry Coryell had performed and recorded a myriad of works, either as a soloist, as part of his band Eleventh House, or in collaboration with Herbie Mann, Charles Mingus, Stéphane Grapelli, Miles Davis, and many more. He also performed in our parent organization’s Sacred Rhythm Festival in Kyoto, Japan, in 2004. Recently, he worked on opera adaptations of Leo Tolstoy’s ‘War and Peace’ and ‘Anna Karenina’. He also released a new album called Brefoot Man: Sanpaku last October, and a new Eleventh House album ‘Seven Secrets’ is scheduled for release on June 2nd. His music continues to inspire musicians and enthusiasts worldwide and will continue for a very long time. 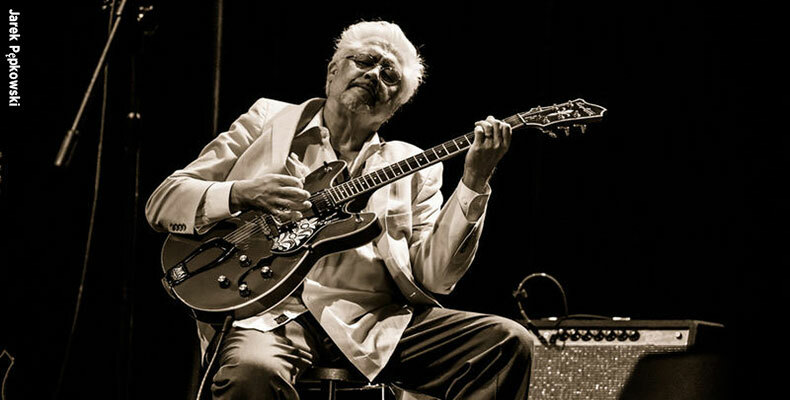 Image source: This image is a derivative of “Larry Coryell 168“, a photograph taken in 2013 by Jarek Pępkowski, uploaded by Wtg to Wikimedia Commons, where it was obtained, with slight zoom, crop, and added rectangle, as well as added photo credit, used under CC BY-SA 3.0. We therefore release this work under the same license.